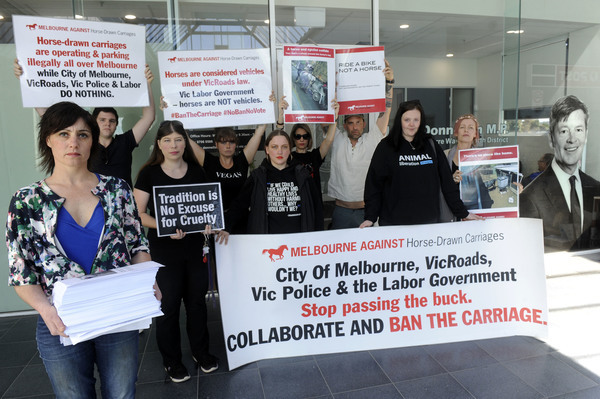 The sight of collapsed horses on the streets of Melbourne has resulted in protests outside the Endeavour Hills office of Roads Minister Luke Donnellan’s office on 12 October. Protesters came armed with 30,000 petitions, all with the central message that horse-drawn carriages should be removed from the streets. “This strong response is further proof that people are sick and tired of seeing horses used and abused in this way,” Melbourne Against Horse Drawn Carriages campaign director Kristin Leigh said. “The Road Safety Act still considers horses as vehicles, with no more consideration than a car or a truck. That has to change,” she said. Horse-drawn vehicle drivers initially had their permits revoked in 2017 after the Lord Mayor of Melbourne cited safety concerns for both the operators and animals. But according to the State Government, the only responsibility operators have is to obey road rules. “There are currently no plans to amend the legislation,” a Government spokesman said.